The Larson Group Peterbilt invests in comprehensive website redesign so fleet owners and drivers can easily find Peterbilt parts, trucks, stores and service information with its new quick-search feature—available on any popular device. Since its founding in 1987, TLG Peterbilt has been driven to provide an unsurpassed customer experience in every aspect of commercial transportation services. Peterbilt drivers and fleet owners don’t have time to dig around for answers. Thanks to our new quick-search feature, people can now grab exactly what they need—right down to the truck's detailed specs. The Larson Group (TLG) Peterbilt recently launched its new, fully redesigned website, which offers customers numerous innovative features designed to resize for perfect performance on all popular web-browsing devices. Announced just months after Peterbilt Motors Company awarded TLG the “2015 Peterbilt North American Dealer of the Year” honors at the Annual Dealer Meeting in February 2016, the new website reflects the dealership group’s commitment to continually improving its award-winning service—at every TLG Peterbilt store and, now, online. TLG’s website now offers a single destination to browse the latest inventory of new and used Peterbilts for sale as well as an extensive list of commercial truck services. A particularly powerful addition to the site is the advanced quick-search feature, complete with time-saving filtering options, that displays results nearly immediately—as fast as the user can enter the search query. “Drivers and fleet owners are busy people who, frankly, tend to visit our website only when a problem needs solving. They don’t have time to dig around for answers. With our new quick-search prominently available throughout the site, our customers can now grab exactly what they need, right down to the truck's detailed specs,” said TLG Corporate Marketing Manager Barbie Langston. If TLG Peterbilt continues investing in its website as an online extension of the unrivaled service customers receive from TLG representatives, it appears the dealership group may soon earn the chance to add more hardware to its collection of customer service awards. For more information about The Larson Group’s Peterbilt parts, trucks or individual Peterbilt stores, visit the newly designed TLGtrucks(dot)com or contact Barbie Langston at blangston(at)tlgtrucks(dot)com. 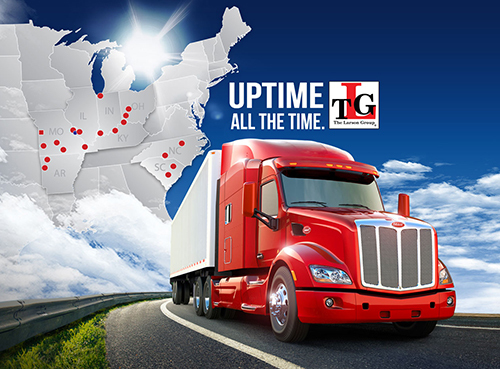 To quickly find solutions to all your Peterbilt needs, visit the newly unveiled TLG website.